Here's some of the things I picked up from Ionia cleaned up! DeForest actually cleaned the cabinet for me as a surprise when I was at work (he was cleaning his rocking chair and decided to be a dear and clean it for me!). I polished it up with some wood wax and put it on the wall. The thread looks so good in it! I love how the slats let all the colors come through. It's a joy to have on the wall. Before, my thread was kept in a big ziplock bag - not only was it sometimes hard to tell what colors I had, but the ends of the threads would get tangled. Now those problems are both solved, and the sewing room looks better to boot! Doors open - thread organized by color, and type (in that my elastic thread is in the bottom left corner). 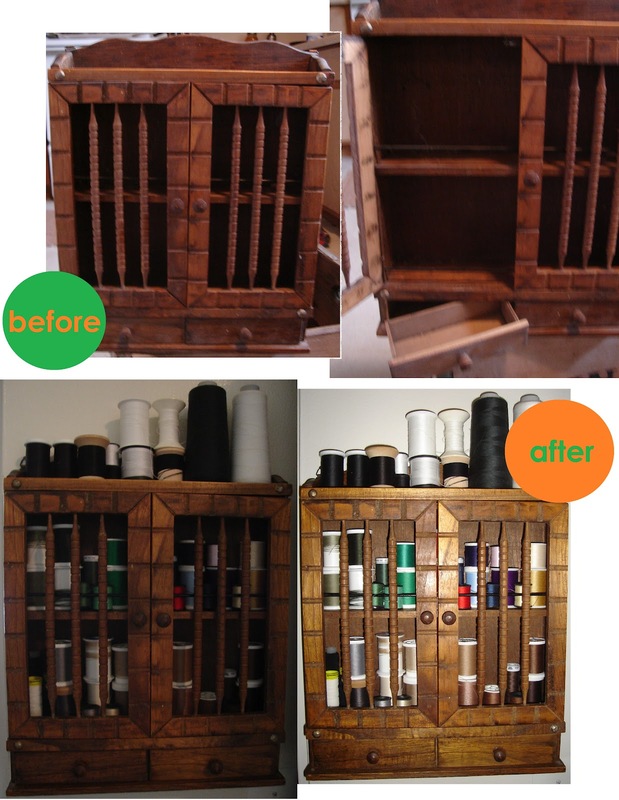 My bobbins are kept in one of the drawers - also easier to see and they don't tangle anymore! The other drawer holds a few needles and my thimbles. The Quaker Oats tin got washed. It now holds the granola I make and looks great sitting on my counter with my other food containers. Some loose tea and brown sugar in the two stacked wooden containers, then sugar and all purpose flour, my oats tin, bread flour (I have a 50 lb bag on the floor, haha) and extra long grain basmati rice. I washed the John Kar Beverages box (a lot of dirt came off of it), and I put my SCA unfinished Pennsic clothes/fabric in it, which is much nicer than having that pile just sitting on the floor. I'm told that John Kar was an old Michigan pop company, which is neat.